Damage appears as large irregular areas of leaf eaten from leaf margins. Several other beetle species resemble grass-grub beetles and their feeding can appear identical. The larvae of such beetles are very similar and expert advice may be required to correctly identify them. 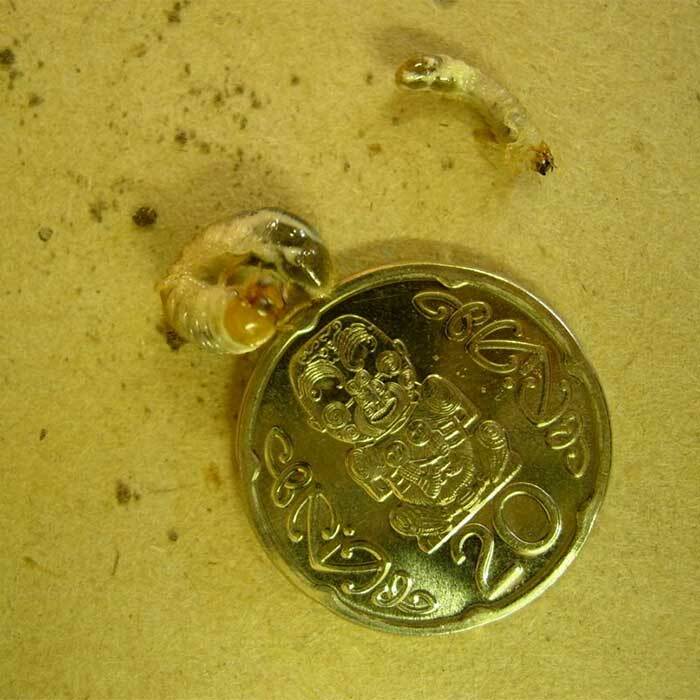 Grass-grub populations are regulated by several diseases which can only persist if grass-grubs are present. 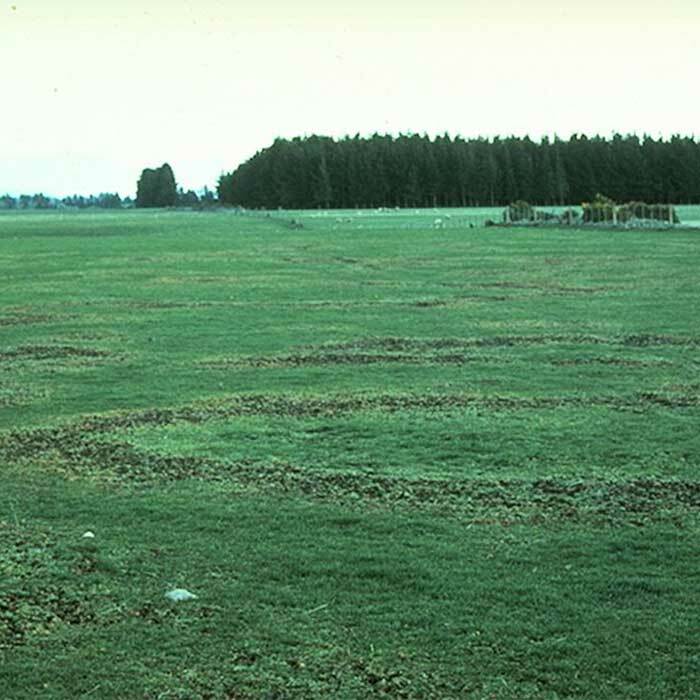 Grass-grub outbreaks, and therefore damage to pastures, usually occur when the grass-grub/disease association is disrupted. 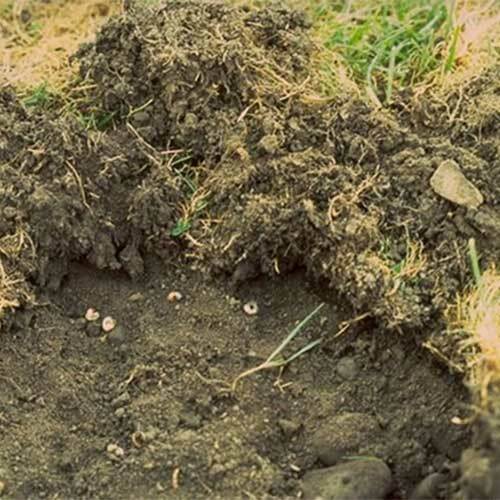 Disruption happens when grass-grub numbers are dramatically reduced and there is no renewal of disease organisms in the soil. Commonly this is a result of cultivation but may also be due to drought and occasionally insecticide use. The low disease levels in the population allow grass-grub numbers to increase causing pasture damage. 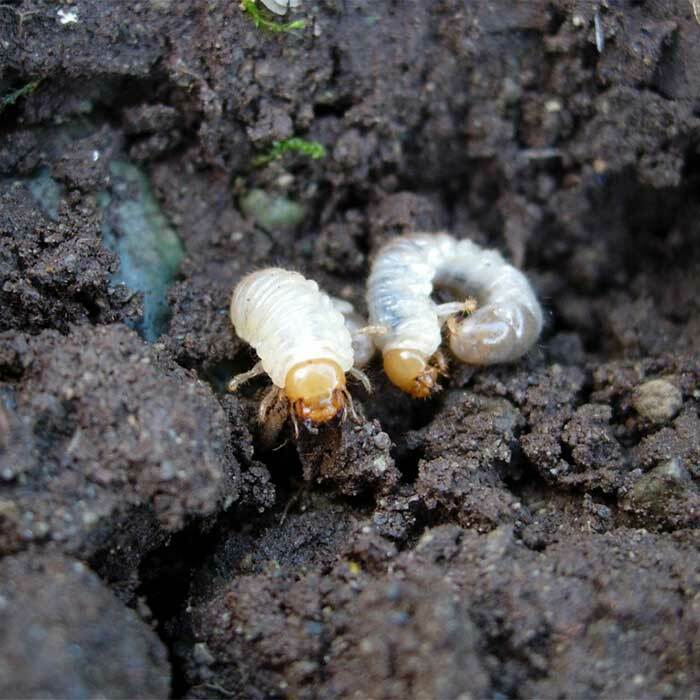 The disease organisms build up in response to increasing grass-grub numbers but there is a lag period before they again regulate grass-grub to below damaging levels. 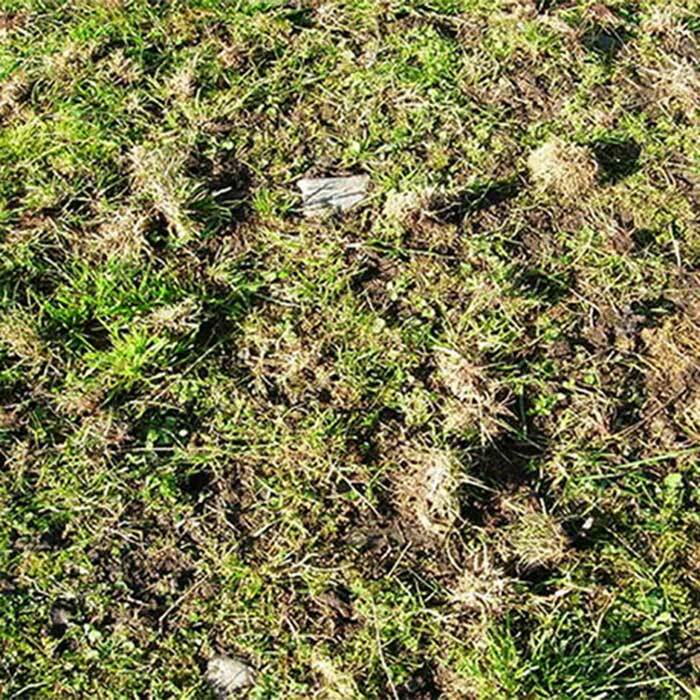 The outbreak most often occurs 2-3 years after the disruption so damage to young pastures, established using cultivation, typically occurs in their second or third winter. Pasture renovation by direct drilling favours retention of grass-grub diseases in the soil reducing likelihood of damage. When the grass-grub outbreaks are the result of drought, pastures of any age can be affected. 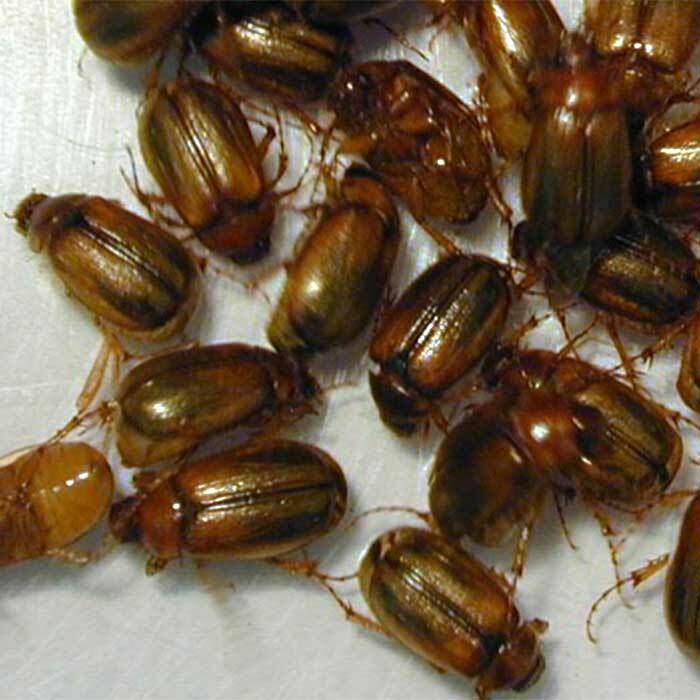 Feeding by the beetles occurs during the later phase of beetle flights and is restricted to spring and early summer. Similar beetles, such as Odontria species, also fly at other times of the year and cause similar damage but are usually less common or restricted in their distribution. Grass-grub beetles feed on the young foliage of a very wide range of plants including grape vines, kiwifruit, blueberries, cereals, brassicas, ornamental and shelter trees and bushes. Damage appears as large irregular areas of leaf eaten from leaf margins and reduces the amount of photosynthetic leaf area available to the plant. Awareness of beetle flights and early recognition of beetle feeding will avoid severe damage. Consult your farm consultant, industry representative or the New Zealand Agrichemical Manual for more information about chemical control. Grass Grub and Porina in Otago and Southland. A guide to management and control. BIP Barratt, van Toor RF, Ferguson CM and Stewart KM. 1990.